Calling Obamacare a government takeover of health care is the “lie of the year,” according to the self-proclaimed oracle of all things true and untrue in the political debate. That outrageous proclamation from PolitiFact shows that its editors need a Truth-O-Meter of their own. Obamacare is a uniquely American government takeover of health care. Its 2,801 pages of legislation and insidious regulatory structure give the Secretary of Health and Human Services almost unlimited authority to rule over every corner of our health sector. The legislation that passed in March creates the scaffolding for the government-controlled structure the administration is busily constructing. Because the law doesn’t call for an immediate nationalization of hospitals or include the “public option” that liberals wanted, PolitiFact claims that it isn’t a government takeover. Even worse, it says Obamacare “relies largely on the free market” to achieve health reform. 1. For the first time in our nation’s history, the government will order citizens to spend our private money on a private product — health insurance — and will penalize us if we refuse. 2. Any employer with more than 50 employees will be told it must provide government-decreed health insurance to its workers — or face financial penalties. 4. The law provides the foundation — and $6 billion — for a stealth public plan. The Consumer Operated and Oriented Plan (CO-OP) program will help set up non-profit, member-run health insurance companies in all 50 states. 5. As many as 80 to 100 million people will not have the option of keeping the coverage they have now, per President Obama’s promise. According to analyst Allisa A. Meade of McKinsey & Company, they will be switched into other policies after the insurance mandates take effect in 2014 ?– whether they like it or not. 6. The federal government will determine what health benefits are essential — or not. 8. The legislation creates the Patient-Centered Outcomes Research Institute that is modeled on rationing boards in other countries with government-run health systems. The National Institute for Health and Clinical Excellence in the U.K., for example, has a record of denying access to the newest drugs, with government officials often deciding they just aren’t worth the cost. That’s already happening here with the FDA’S withdrawal of its approval for Avastin last week. 9. States are being treated like contractors to the federal government, ordered to expand Medicaid to levels that could bankrupt them, and to set up new Health Exchange bureaucracies lest the federal government sweep in and do it for them. 10. Obamacare expands Medicaid, the worst health plan in the country, to cover 84 million people by 2019, stretching yet another of our government-run health programs to the bursting point. Attorney John Hoff, in a paper for the Heritage Foundation, calls Obamacare “a new exercise in old-fashioned central planning.” PolitiFact needs to revisit its decision or it will soon find that its own pants are on fire. Published in The Examiner, December 21, 2010. 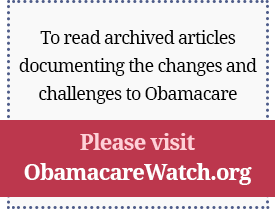 Previous Article: First Step in Dismantling ObamaCare?